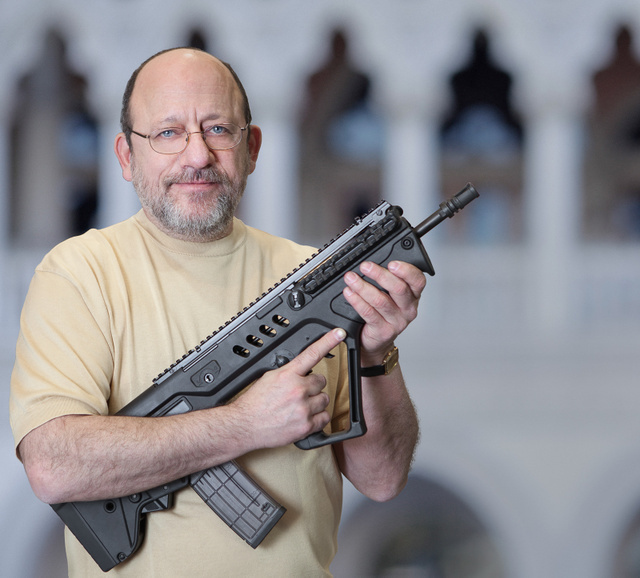 Michael Kassnar of Trans World Arms holds the semi-auto Tavor. An improved version of it will be produced in the US later this year. I really like that the field-stripping yields just two major sub-assemblies without any loose small parts. This entry was posted in interesting people, rifle and tagged 223, bullpup, Charles Daly, Michael Kassnar, semi-auto, SHOT show. Bookmark the permalink. Unfortunately I’m disappointing at the 26″ OAL and only a 16″ barrel, especially when compared to the RFB’s 26″ OAL and an 18″ barrel in 308. You’d think they could easily have done a 5.56 with a 18-20″ barrel and kept the OAL at 26″. 18″ barrel might work better. On the other hand, I plan on sound suppressing mine and would prefer the shortest legally possible barrel to keep the balance reasonable. Fragmentation range of M855 ball is irrelevant to me as I’d use controlled expansion bullets and, in any case, self-defense ranges are usually well below either 150 or 175m. But if you can get more barrel in the same OAL, why not? Also, wouldn’t a longer barrel help in silencing, as more of the gas’ energy ends up in the projectile? The effect is probably marginal at best, but I keep coming back to if it has to be 26″ why not have a longer barrel if you can do so. It likely boils down to ergonomics — they CAN put the action so far back that the back of the magazine is within an inch of buttplate, but that would be highly impractical for a number of reasons, among them being that it would almost certainly be ejecting into you, which would affect reliability and shooter comfort, and that on top of making changing magazines much more difficult. They could move the magazine forward relative to the chamber, ala the Boberg XR9 that’s been featured on this blog, or a number of machineguns before that. Could do that….but then we’d not be able to use AR15 mags. Oh, it would still be possible, but more complicated. Haven’t given it overwhelming amounts of thought, but I suppose you’d probably have an extension of the bolt strip rounds out of the magazine and load them into an intermediate stage, similar to a single-round tubular magazine, and then on the next cycle, strip it out and load it. Advantage would be that there would actually be a round in the rifle, even if you drop the magazine when empty. Disadvantage (aside from added complexity) would be that, if you shot all the way dry, you’d have to cycle it twice in order to chamber a round. I bet there are other solutions, as well, but I doubt any of them are simple. You could certainly make them function with lightly-modified AR magazines, and probably have those magazines be reverse-compatible with other firearms, even if standard AR mags would not be compatible with yours. Love the “bullpup” design. With regards to the 12 ga. bullpup, any chance of a semi-auto version? The ones I usually see in crowd are dusty and covered with scratches. Absolutely, am so ready for that exact version to come out. I DO WANT!!!! Bad!! !